This evening's work session wasn't very lengthy but it included a major milestone in the fuse construction. The Airdrome Aeroplane guys don't use jigs in the construction DVD, but they have many sets of hands available to hold bits and pieces in place as someone drills rivet holes. But I only have one pair of hands so I need "extra hands" in the form of jigs and fixtures. These are very simple but sturdy helpers that hold everything in place while I am drilling and riveting. 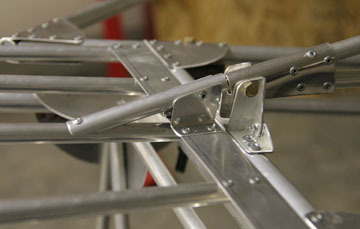 All the cross members and diagonals are in place in the forward section of the fuse but the sides must be joined at the tail post before the remainder of the members can be installed. 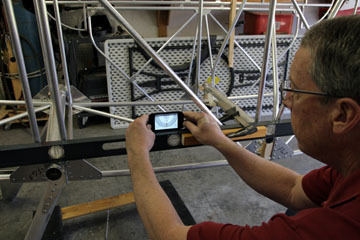 This is a critical step because the alignment of the tail surfaces is much easier if the fuse is straight and square in relation to the tailpost. A lot can go wrong in this step so additional jigging was added to the bench to lock the tailpost in position. Here is the ultra-sophisticated fixture made from more shipping crate left-overs. The fixture was carefully plumbed on the fuse centerline that was chalked on the benchtop. It is important to maintain alignment as the holes are drilled. 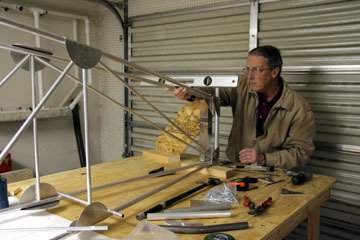 Several clamps and clecoes served as extra hands. 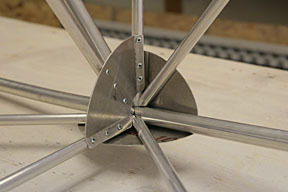 This photo was taken after the gussets had been drilled and riveted. I just had to check it one more time to make sure all was straight and level. It is. 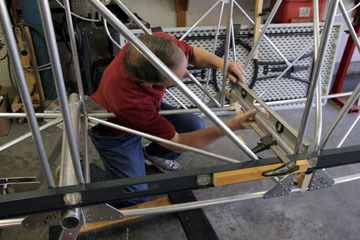 The "factory" way of blending the fuse longerons into the tailpost is to heat anneal and flatten them (with a hammer!!) to half diameter. I used a Dremel with cutoff wheel to cope the tubes so they would fit the tailpost. The remaining stations and diagonals are now in place. There were a couple of places where clusters got sorta busy and access with the drill and rivet gun were difficult. In those cases I added a slight break on the edges of the gusset so I could get a straight shot with the drill. A 12" bit also comes in handy in tight spots. We have a D7 backbone. There is still much to add to the fuselage but we now have a good starting point for adding gear, empenage, wing carry-throughs, etc. Time to give this plane some legs. 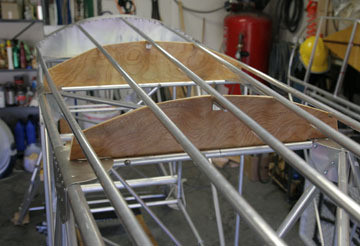 1" aluminum strips were bent into angle stock for attaching the rear cabin cowl to the cabin bulkhead. 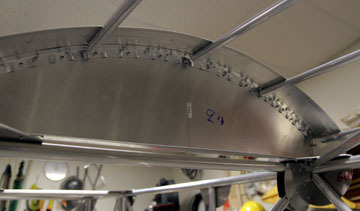 Fluting pliers were used to form a curve in the angle so it would follow the shape of the cowl. Five stringers run from just forward of the horiz stab up to the cowl bulkhead. 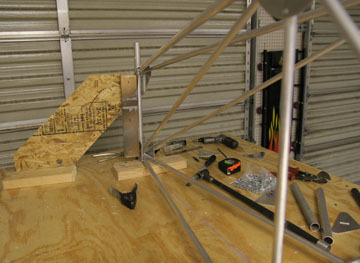 I will fabricate two formers to hold the stringers in place so they won't be deformed when the fabric is shrunk. Here is the little dorsal fin that fairs the vertical stab into the turtle deck. 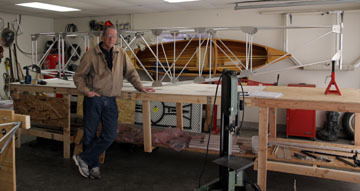 3/16" plywood formers are installed to support turtledeck stringers. 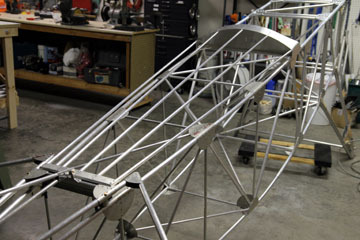 One of the most critical dimensional steps of the entire plane is the fabrication and installation of the lower wing spar carry-throughs. 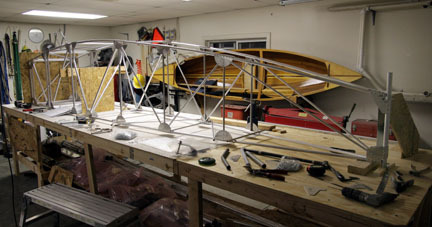 These components are the basis of the fuse/wing spatial relationship and must be accurately located if the remainder of the construction is to go well and the plane is to fly as designed. The carry-throughs must be square with the fuse and located so the front and rear spars yield 2.5 degrees of positive incidence. The fuse was very carefully leveled, then checked several more times before the spars were fabricated and installed. I used a protractor app on my phone to set the incidence then clamped everything into place. 1/8" pilot holes were drilled, then stepped out to 3/16", everything checked again, and final drilled to 5/16" for the AN5 bolts.